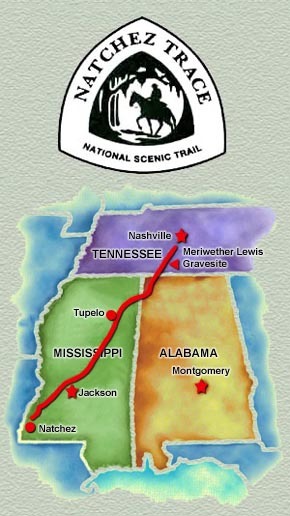 On October 27th, and from the capitol in Nashville Tennessee, the Nimblewill Nomad began yet another grand adventure, a journey through the "Old Southwest," down the historic Natchez Trace National Scenic Trail. The driving purpose behind Odyssey 2003 was to visit the grave of Meriwether Lewis, at Meriwether Lewis Monument in Lewis County Tennessee, where rests the remains of that great explorer and statesman who took his own life at a place called Grinder's Stand. Surely, there is no man alive today, save, perhaps, Norman Miller, who's spent more time with Lewis and Clark. And so it was to be expected, to begin Odyssey 2004, the Nimblewill Nomad would pass the grave of William Clark in Bellefontaine Cemetery, St. Louis. Thus, during these odysseys has the old Nomad traveled with the Corps of Discovery, lived with them -- and thus does he know them well. 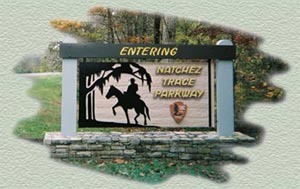 NOTE: If you click on the map above, you can view or print a large detailed map of the Natchez Trace.